The current market has an unparalleled access to latest technologies which are just waiting to be exploited. But application failures or performance issues can diminish the company?s market value and not to mention reduce its competiveness. Effective Maintenance of such applications and technologies is what drives the business towards perfection. In order to build a thriving and a constantly evolving organization, you will require services which expertly deliver solutions in application Maintenance & support. Application management ensures high performance business applications with superior service availability. It also provides you with a holistic view of your resources so that you can optimize your visibility in the industry. 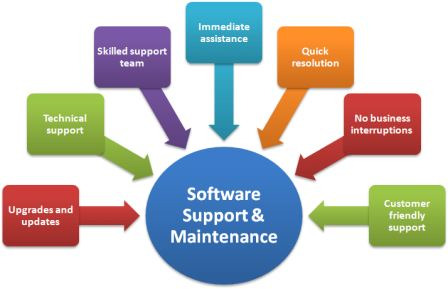 Why Application Maintenance & Support Services with Us? The challenges that an enterprise might face with application maintenance is the high operational cost along with the failure to support the applications as per the business requirements. We at Enaviya provide you with end to end services which will help you manage your applications proactively. Our services ensure that you enjoy higher productivity over time with a standardised delivery system for your customers with plenty of scope in terms of modernisation and innovation for your company. We plan and provide expertise on several verticals including process and change management so that your services evolve as per the customer?s need. We assure you that with our application Maintenance & support services in your arsenal, you will successfully transform your business statistics. Production Support Services: Enaviya's production support is designed to provide you with access to our experts 24x7 with quick response to the entire support request. Our services evolve constantly as per the production environment. We deliver the best support services ensuring your success in every step. Software Release and Change Support Services: Enaviya's comprehensive and meticulously planned release and support system allows your clients make a smooth transition from one release to another. We also make sure that we minimise the possible risks during the knowledge transfer within the organisation. Middleware Product Support Services: Enaviya covers a broad platform in middleware technical support which monitors the performance of various software developments using integrated reports. This method ensures that you receive advanced level support in all the middleware products including application deployment, user administration and DW/BI tools. Our excellent support system pinpoints technical issues effectively so that you can reduce your costs and continue to perform optimally.